1. PNC Bank isn’t the problem. Seriously guys. PNC is a medium-sized local-ish bank that avoided the risky investments that have caused the credit crunch. 2. Breaking windows and vandalizing people’s stuff is about as likely to make your message popular with the people as hitting them in the face. Seriously, nobody likes a jackass. I’m down with free speech, but that’s not a freedom to break other people’s stuff, mmkay? Oh, and by the way, if you want to stop the delegates from leaving your hotel, that means you have to be there before they leave, okay? So maybe tomorrow don’t stop for Starbucks, and don’t sleep past 9. Or, maybe let the adults go to work, and you kids can stay home? That’d be just fine with us, too. This entry was posted in: Life in the Capital, The Daily Feed, WTF?! The actions the Washington Post covered all started promptly at 7am. The group organizing the non-violent direct actions, Global Justice Action, announced their actions via their website and via press releases and stated quite clearly that they were starting at 7am. They ran a twitter feed about the action (@globaljusticeac) that clearly indicated they started at 7am. It was also reported elsewhere that the meetings were delayed by two hours while authorities cleared people out of the streets (and, as mentioned in the Washington Post, clearing the streets involved sending one man to the hospital with a dislocated knee, deploying pepper spray, and beating people). So your comment at the end is simply incorrect and demonstrably so. Also, I’m not getting the “adults” comments: Are you implying that anyone who believes that the IMF and the World Bank should be abolished (a position that’s widely supported throughout the world outside of the United States and backed by no small amount of scholarship and activist tradition) is immature? Which sounds like ya’ll stopped for a latte before heading to the hotels to block the delegates. What I’m implying is that vandalism and sign-waving at delegates who you can’t reach with messages they aren’t receptive to seems an awful lot like the definition of insanity: Doing something over and over again, expecting a different result. So, be polite in our town while you’re here. 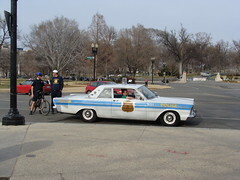 Don’t spray-paint cars, or break windows, and for the love of God, don’t expect the DC Police to tolerate your shenanigans and just accept your reckless and wanton disobedience of the law. I think it’s really problematic that you think that police violence directed at large numbers of individuals is justified based on the actions of a few. That’s an argument that says that it is okay for the police to assault the innocent. I get that your troubled by the property damage. But human beings are a much more precious commodity–especially when they probably weren’t the ones who broke the windows since all available evidence indicates those individuals were arrested and, thus, not at the demonstrations where police pepper sprayed and beat people up (and, to reiterate, sent someone to the hospital with a dislocated knee). At the recent G20 meetings, a man who coincidentally was walking past the protests was beaten to death by police. I think we need to be very careful about reactions to protests we don’t like that essentially endorse police violence, given that they are the ones in this with the higher capacity to kill or injure. Also, Tom, I was born here. So please don’t say “our town” as if I’m not part of it. It is entirely possible for two people to be from the same city and not agree on political issues. “Authorities used batons and pepper spray when activists tried to march onto a prohibited street, and several people were pushed to the ground by police. The protesters swarmed officers unexpectedly, and police had to respond, said D.C. police Capt. Jeffrey Harold. Which means the group violated their protest permit, and one of your number assaulted a policeman. So, really, if you expect me to take you at your work that “But human beings are a much more precious commodity,” please explain your group’s treatment of the police, who were just trying to get your group to comply with the permit that you’d been issued? (1) you are again making personalized assumptions here: how do you know that I broke any laws? I, in fact, did not. Please stop this. It’s not a good way to conduct a discussion. (2) Breaking the law is a well-worn tradition of social justice activism so getting mad that protesters broke the laws simply because they broke laws is odd. Would you say the same thing to Rosa Parks? Coming back with “well she did it in revered way X Y and Z” doesn’t work as you generalized to the topic of any kind of law breaking. You are legally permitted to hold a spontaneous street march in Washington, DC. The rules are as follows: You are required to leave one lane of traffic open. If the police declare the march unlawful (a variety of specific conditions inform that), the police are required to give three warnings, followed by providing a clear and easy path out of the area for all protesters. This is documented online in a lot of places. In 2002, police did a huge roundup of protesters at Pershing Park–arresting several dozen people with a nursing convention and accidentally arresting IMF delegates. A lawsuit resulted and what I described to you in the above was the result, as well as about a 400K settlement. So being in the street is not reason to deploy police violence. (4) The accusation of a protester pepper spraying police was later changed by police to the protester kicking the police. The protester was then released without charges later. So I think it’s reasonable to suspect the incident never occurred, but reasonable people can disagree about that and it’s clearly hearsay at that point. (5) I am really troubled that you’re still not dealing with your earlier insistence that it’s okay for police to beat up a crowd of people, likely targeting a wide variety of people who aren’t breaking the law, nor are you reconciling with the fact that police are the ones with the guns and the MASS amounts of pepper spray. No police were seriously injured. Protesters clearly were. So your argument is falling a little short. Protestor, with regards to (1), since you appear to be acting as spokesman for the group of protestors, my language has been possessive: “your group” and “one of your number,” which are indicative of your participation. With regards to (2), really? Rosa Parks? I’m not sure the parallel is even remotely apt. You’re welcome, though, to expound upon your metaphor. For (3), but what if you actually have a protest permit and then act in violation of it? I’ll admit that I haven’t gone to look up the law. Can you point me at the right place to view the appropriate statute? I remember the 2002 events. I was walking to work with my wife up Vermont, when the protestors decided to throw a brick through the window of the Citibank at Vermont & K. That’s when the police had enough, and we very nearly got teargassed because of it. Regarding (4), I’m pleased to hear that the journalists’ reports were in error. I’m not for violence, not in any way, but that leads me toward (5): There are clearly violent elements within this protest movement, we saw their actions on P Street. We’ve seen their actions in the past. It’s not about civil disobedience for this vocal minority, even if it might be for folks like you. Where’s the policing from within the community? Forgive my frustrations with the situation, I get keyed up when there’s nothing but police action after police action when the WB/IMF meetings come to town. It’s not the meetings that I object to: it’s the violent incidents that are associated with them. I think it says a lot about the nature of these protests that the police have such cut-and-dry rules regarding them in the first place. Who to side with? The banks that have made ruins of our financial system? Or the protesters that shut down parts of town and smash up local businesses like a gang of sign-toting Vikings? The answer is: None of the above. I’m sure many- perhaps even a majority- of these protesters mean well, but frankly the actions of the few make the whole mob look like a bunch of jackasses. Yeah… thats also a good way to look like a jackass, while we’re at it. There’s no question that in the game of Protestors vs Police there are jerks on both sides.